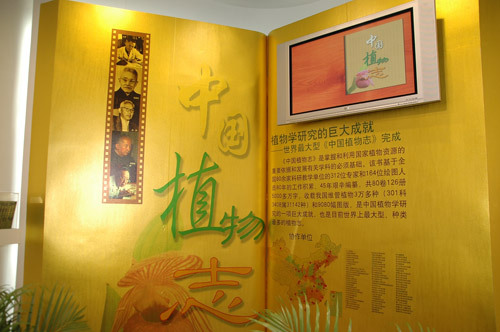 "Compilation of Flora Reipublicae Popularis Sinicae", completed by famous botanists including QIAN Chongshu, CHEN Huanyong, WU Zhengyi, WANG Wencai, LI Xiwen, HU Qiming, CHEN Yilin, CHEN Xinqi, CUI Hongbin and ZHANG Hongda, won the first prize of 2009 China's State Natural Science Award. The first prize of China's State Natural Science Award was once vacant for 7 years and was vacant again in 2007 and 2008. Academician WU Zhengyi and Researcher LI Xiwen from Kunming Institute of Botany (KIB), CAS, are respectively ranked 3rd and 5th among all the prize-winners. Academician WU Zhengyi held the post of member of Editorial Committee of Flora Reipublicae Popularis Sinicae from 1959-1972, associate editor from 1973-1986 and chief editor form 1987-2004. While WU was the chief editor, 54 volumes 82 fascicules of Flora Reipublicae Popularis Sinicae were finished and published. In the period of chief editor and associate editor, WU spent a lot of time looking over the volumes and fascicules in accordance with herbarium specimens. In addition, he took on some difficult and major tasks and accomplished 2/3 of the whole compilation. WU was responsible for and pro-active in editing the following 9 volumes which contained 8 families 152 genera 1109 species (according to incomplete statistics), including 65th (2) fascicule, 66th volume (Labiatae); 67th (1) fascicule (Solanaceae); 64th volume (Convolvulaceae, Polemoniaceae, Hydrophyllaceae); 13th volume (Araceae, Lemnaceae); 26th volume (Caryophyllaceae); 23rd volume (Moraceae); 32nd volume (Papaveraceae, Capparaceae); 1st volume (General Instruction); etc. Researcher LI Xiwen took the position of member of Editorial Committee of Flora Reipublicae Popularis Sinicae from 1973-2004, lasting 26 years among which 17 years as member of the standing committee. LI participated in editing 65th (2) fascicule, 66th volume (Labiatae) and took charge of compiling 31st volume (Lauraceae) and 50th (2) fascicule (Clusiaceae), involving 4 families 62 genera 541 species. The main academic achievements of LI Xiwen include gaining a clear idea of all the species of Labiatae, Lauraceae and Clusiaceae; giving detailed explanation of name, morphological specificity, phenological period, habitat, distribution, utilization and systematic position of each species; providing excellent pictures together with the explanations; and publishing academic articles and papers on newly categorized species, phylogeny and plant geography. These achievements lay a steadfast foundation for development and utilization of plant resources, phylogeny and floristic study and biodiversity conservation. In addition to Academician WU and Researcher LI, scholars and scientists from KIB, who are members of Editorial Committee of Flora Reipublicae Popularis Sinicae, are CHEN Jie (compiling 65th volume 1st fascicule, 58th volume, involving 5 families 40 genera 393 species); and CHEN Shukun (compiling 43rd volume 3rd fascicule, 45th volume, 73rd volume 1st fascicule, involving 4 families 16 genera 292 species); Other KIB staff include FANG Ruizheng (compiling 57th volume 1st fascicule, 57th volume 3rd fascicule, involving 4 families 29 genera 304 species); FENG Guomei (compiling 49th volume 2 fascicule, involving 1 family 16 genera 83 species); MIN Tianlu (compiling 45th volume 1st fascicule, involving 6 families 21 genera 73 species); CHEN Sanyang (compiling 13th volume 1st fascicule, involving 1 family 26 genera 99 species); PEI Shengji (compiling 13th volume 1st fascicule, involving 1 family 26 genera 99 species); and WU Sugong (compiling 13 volume 1st fascicule, involving 2 families 3 genera 159 species). Botanists who also participate in compilation of the Flora Reipublicae Popularis Sinicae are ZHUANG Xuan (editing 4 families 45 genera 269 species), SU Zhiyun (editing 1 family 1 genus 288 species), LI Heng (editing 4 families 47 genera 232 species), HUANG Shuqiong (editing 3 families 8 genera 133 species), HUANG Suhua (editing 3 families 26 genera 132 species), BAI Peiyu (editing 1 family 13 genera 106 species), XU Tingzhi (editing 2 families 12 genera 79 species), XUAN Shujie (editing 1 family 12 genera 57 species), TAO Deding (editing 3 families 21 genera 48 species), YIN Wenqing (editing 1 family 18 genera 45 species), LI Yanhui (editing 3 families 9 genera 44 species), BAO Shiying (editing 2 families 5 genera 43 species), CHEN Zonglian (editing 1 family 1 genus 31 species), TONG Shaoquan (editing 3 families 11 genera 31 species), LI Dezhu (editing 1 family 1 genus 29 species and member of the Editorial Commitiee for 1997-2004), ZHOU Xuan (editing 1 family 6 genera 24 species), LI Yaru (editing 1 family 2 genera 15 species), TAO Guoda (editing 1 family 5 genera 14 species), CAI Xitao (editing 1 family 4 genera 9 species), CHEN Peishan (editing 1 family 1 genus 1 species), etc. PENG Hua, LI Dezhu, SUN Hang and ZHOU Zhekun, 4 researchers of KIB, contribute to compilation of 1st volume of the Flora Reipublicae Popularis Sinicae. Flora Reipublicae Popularis Sinicae is a monumental work which summarizes the classification of vascular plants in China. The book contains 80 volumes 126 fascicules, amounting to over 50 million Chinese characters. In the Flora Reipublicae Popularis Sinicae, 301 families, 3408 genera, 31142 species of vascular plants are recorded with nearly 9000 pictures. In 1956, Flora Reipublicae Popularis Sinicae was officially put into the Program for the Development of Science and Technology proposed by CAS. In 1959, the Editorial Committee of Flora Reipublicae Popularis Sinicae was established by CAS with Academicians QIAN Chongshu and CHEN Huanyong as chief editors. Afterwards, Academician LIN Rong, Academician YU Dejun and Academician WU Zhengyi successively took the position of chief editor. Academician WU Zhengyi acted as chief editor for 17 years and accomplished 2/3 of the whole compilation work, making significant contribution to the completion of Flora Reipublicae Popularis Sinicae. In September of 1959, the first fascicule (Pteridophyta), edited by Academician QIN Renchang, was published. After that, four generations of 312 scientists from domestic scientific institutes and universities and 176 botanical illustrators joined in compilation of Flora Reipublicae Popularis Sinicae. Under the consistent support of CAS, NSFC and MOST, after 45 years endeavor, the Flora Reipublicae Popularis Sinicae was published in 2004 with 80 volumes 126 fascicules, amounting to 50 million Chinese characters. To date, the Flora Reipublicae Popularis Sinicae is the largest flora reference in the world. Compilation of Flora Reipublicae Popularis Sinicae is a tremendous system project. During the entire project, researchers collected more than 17 million plant specimens outdoors, studied and referred to almost 17 million herbarium specimens, took over 20 thousand photos of rare plant specimens (especially type specimens), drew up hundreds and thousands of reference cards, proposed new genera and genera names with a total number of 243, and presented 14312 new species and species names. Four generations of botanists bravely forged ahead with whole heart. They journeyed all over the country to inspect plants and collect specimens. Their persistence and preciseness show the high spirit of Chinese botanists. Flora Reipublicae Popularis Sinicae is not only a "register book" of each plant, but also important database for recording and studying botanic features of plants. It is regarded as the most foundational scientific work and the most important information carrier in botanical research and study. Flora Reipublicae Popularis Sinicae, as the most accurate, most comprehensive and most canonical academic work on recognition and record of plants in China and peripheral countries and regions, lays a profound foundation for sustainable development of plant resource and provides indispensable reference for deep study on agriculture and forestry development, ecological transition and global warming issue.